People have known, explored and used magnets for thousands of years. Still we have problems explaining what it really is, there seems to be something magical about the phenomenon. Sure you can get amazed about how moving pictures can be transmitted to TV receivers over the hole world, but it's still a technique that is created by man. Even for science magnetism is something that is taken for granted, rather than created, and hard to explain. In general its hard to reduce magnetism, i.e explain it in more basic terms, and this is reflected in scientific terminology. Visual light is composed by electro magnetic waves, the same type of waves if used on other frequencies can heat food in our microwave ovens, give us a summer tan or transmit sound and pictures to our TV- receivers. Together with gravitation, electro magnetism is also generally counted as one of the four basic forces in nature. In some scientific and philosophic views, at least figuratively, it is even considered to be the cause of life it self. You can believe what you want about that but it's still gives an indication about how hard it is to explain and how "magical" magnetism is. Luckily we don't have to go so deep into describing magnetism in order to use it. An magnetic field is created around every electrical flow. In that way even a cord to a lamp becomes an electromagnet. The magnetism around an ordinary lamp cord is insignificant, but if you twine the cord around coiled spools, the field is increased. This technique can give very powerful electromagnets, with a power that can be turned on and off. Just like the permanent magnets, the electromagnet has a traction force on some materials. Object of such a materials, those that we in common language call "magnetic", also have the potential to work as magnets them self. An ordinary screw driver can, after being in contact with a magnet, be used to pick up lighter screws. But these magnetic characteristics are at this point week and this effect also decrease relatively quickly. The materials in permanent magnets have to be able to be charged to a higher magnetic electric level and be resistant against demagnetization, with other words they have to be able to obtain their magnetic characteristics in different environments. 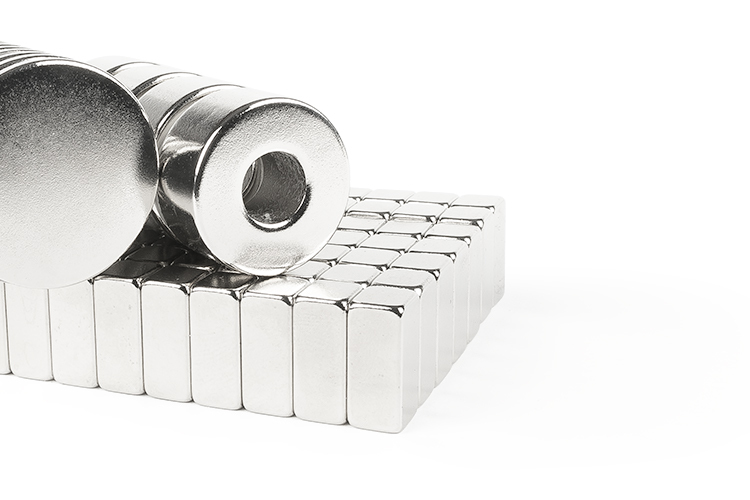 With the new materials and production methods we have nowadays we can manufacture magnets that by far exceed the classic magnets. What different types of magnetic materials is available today? 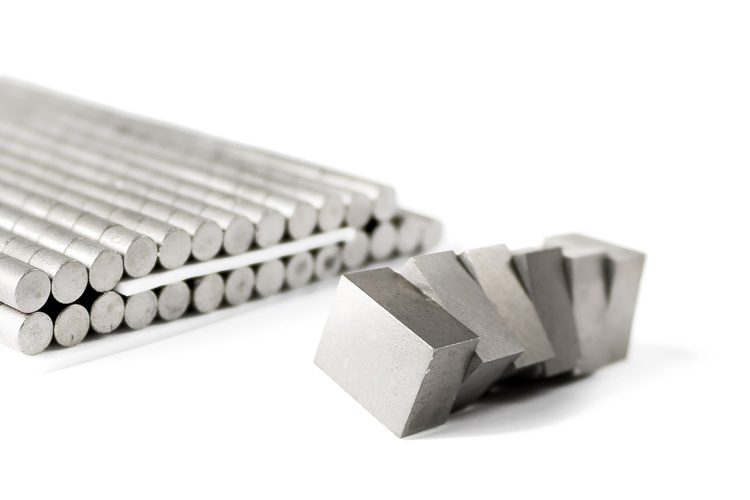 Sintered neodymium-iron- boron (NdFeB) is today the most powerful material, with magnetic characteristics that are superior to the traditional materials. High heat resistant qualities has been developed over the years, and this has lead to new possibilities to use the materials in generators and engines. Hyab provides approximately twenty qualities to address the needs of our customers. NdFeB-magnets oxidate easily, therefore the magnets are always delivered with a galvanic coating. 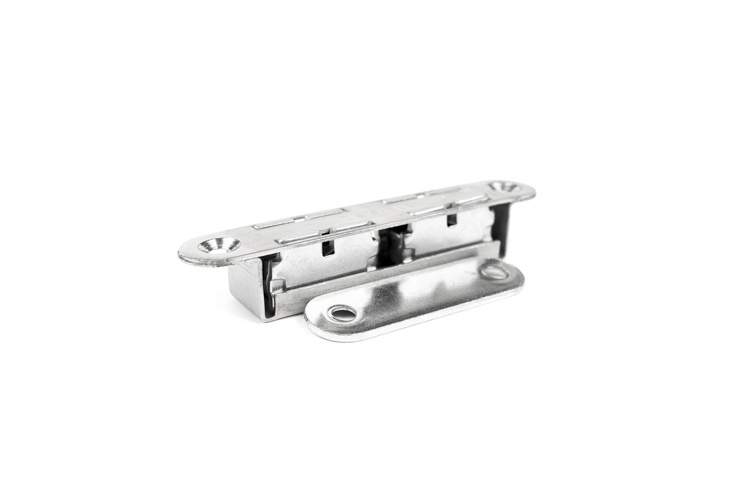 Our standard standard range are coated with nickel or zinc. Alnico, aluminum - nickel-cobalt, was developed in the 30's. Alnico is a very temperature resistant material that is heat resistant up to 500°C. The material has also a high remanence, Br. This have made Alnico a popular solution in, among other things, sensitive measuring instruments. 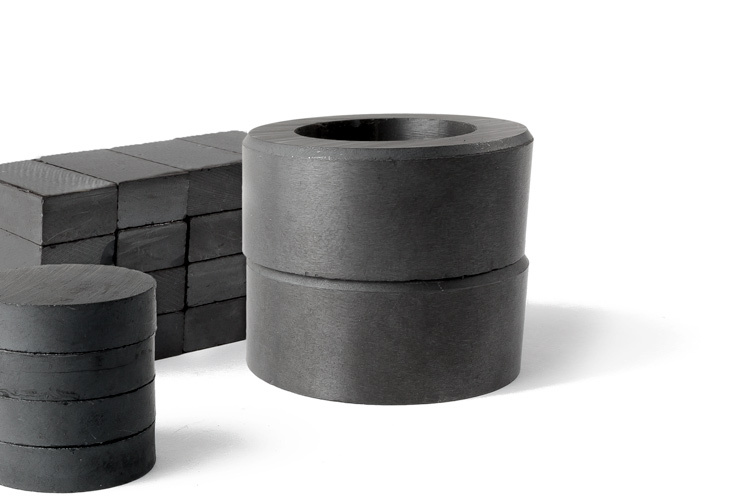 Sintered strontium ferrite is the dominating material on the market, much due to the low price. Ferrite magnets are used mostly in speakers and motor segments. Samarium Cobalt is a high energy material, much like Neodymium, that can resist temperatures as high as 350°C and has for many decades been used in motor segments and other high temperature applications that call for high energy magnets. The development of SmCo5 to Sm2Co17 has led to further improvements in the magnetic properties. HYAB is providing a number of qualities. 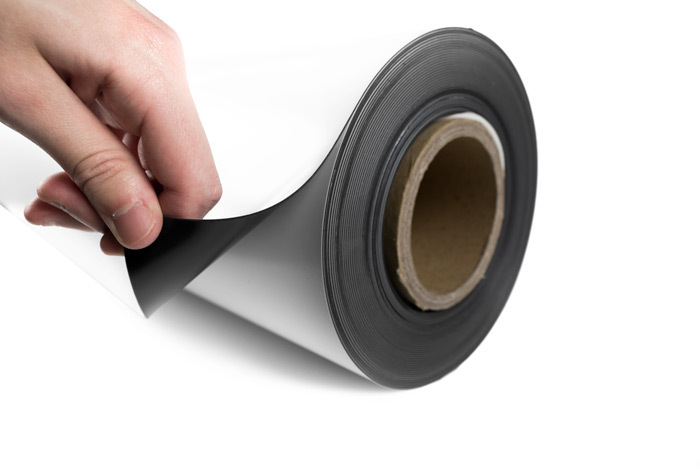 Plastic Bound ferrite is a soft and flexible material that can be punched or cut to a desired shape. The material adapts well to curved surfaces and is therefore ideal for signs, decals for cars etc. The distinction between anisotropic and semi-anisotropic materials, is that the latter have only one magnetic side. Tapes are usually semi-anisotropic, while rugs and strips are available in two versions. 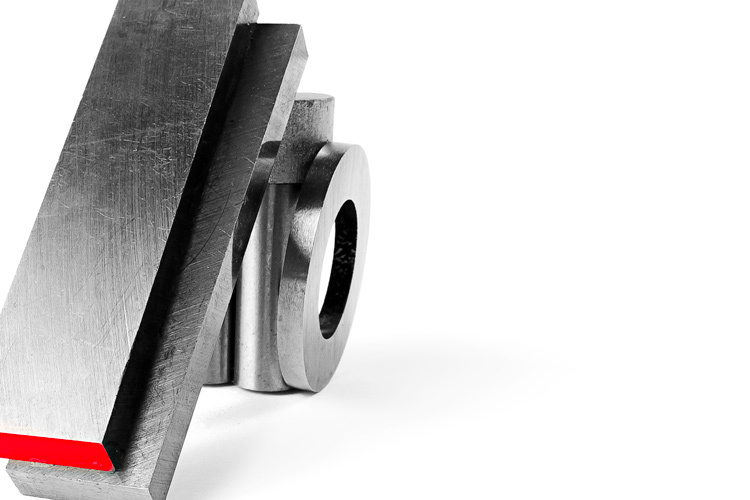 Choosing the right magnet system is often critical to the finished product. If for example the function of the magnet is to fix or lift, then ferrite encapsulated holding magnets are three times more effective than a simple magnet. In order to separate particles from a liquid it's preferable to choose one of our tested separator systems with many short, powerful flows. Hyab manufactures and stocks a wide range of magnetic systems, ranging from very small systems in medical equipment to the separators of iron ore for the mining industry. In the catalog you will find a selection of our range. Contact us and we'll help you find the right magnet system. 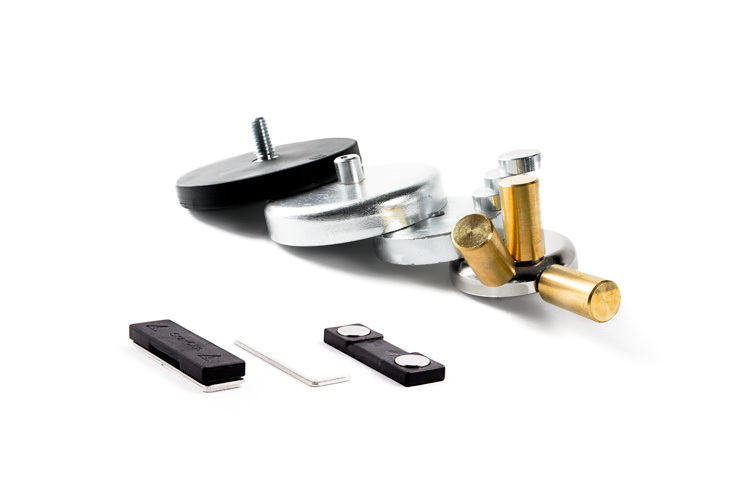 We have the power holding magnets, holding magnets, rails / locks and sheet separators. In Hyabs standard range of electromagnets you find lifting magnets, holding magnets and pull and push magnets. Lifting magnets of 18 mm diameter with a lifting force 60 N up to the diameter of 3 meters with a lifting capacity of several tons (electro-and electro permanent lifting magnets). Pulling magnets can replace pneumatics in many constructions The magnets are either single-acting, that is magnets pulling / pressing in one direction while the return happens in another way (eg, spring), or double-acting with two coils and reversible nature. Holdingmagnets are used for lifting or to fix a detail. Our standard range is designed for 24VDC, 100% ED. 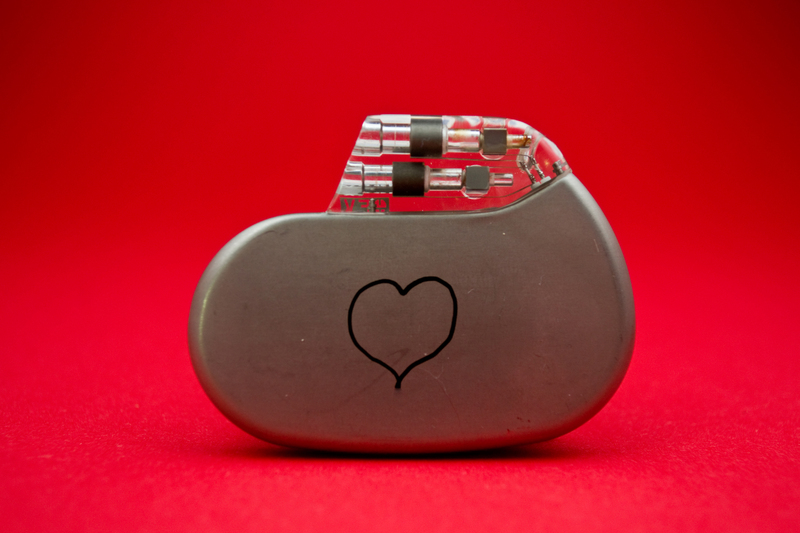 The implantable pacemaker is a Swedish invention and causes the heart to beat at the correct pace. The pacemaker task is to send electrical impulses to the heart so that it beats regularly. A older pacemaker is more sensetive than a never one, and you should not bring a neodymium magnet closer than 25cm. A newer pacemaker is less sensetive, and has a safety-distance of 20cm. The ferrite material is not as strong as neodymium and has shorter magnetic fields. Safety -distance from a ferrite magnet is approx 18cm. If a magnet accedently comes to close to your pacemaker, then just easily move it away. The pacemaker will directly return to its normal programming and the pacemaker will not take any damage / need to be re-programmed.